A new study of pollution-filled “brown clouds” over south Asia has found that they enhance solar heating of the lower atmosphere by about 50 percent. The researchers, from the Scripps Institution of Oceanography, say the combined heating effect of greenhouse gases and the brown clouds, which contain soot, trace metals and other particles, is enough to account for the retreat of Himalayan glaciers observed in the past half century. Writing in Nature, lead researcher V. (Ram) Ramanathan (pictured) noted that the glaciers supply water to major Asian rivers including the Yangtze, Ganges and Indus and comprise the chief water supply for billions of people in China, India and other south Asian countries. “The rapid melting of these glaciers, the third-largest ice mass on the planet, if it continues, will have unprecedented effects on southern and eastern Asia,” he warned. 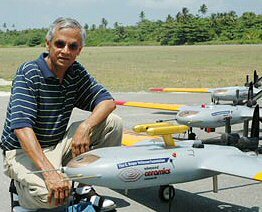 His conclusions are based on data gathered in the Maldives by a fleet of unmanned aircraft. The Maldives Autonomous unmanned aerial vehicle Campaign (MAC) took place during the region’s dry season when polluted air masses travel south from the continent to the Indian Ocean. The air typically contains particles released from industrial and vehicle emissions as well as through biomass burning. Such pollution has the dual effect of warming the atmosphere as particles absorb sunlight and of cooling the Earth’s surface as the particles curb the amount of sunlight that reaches the ground. The net effect of the two forces remains uncertain, but other research by Ramanathan has suggested that the surface dimming might serve to mask global warming, leading scientists and the public to under-appreciate the full magnitude of climate change. 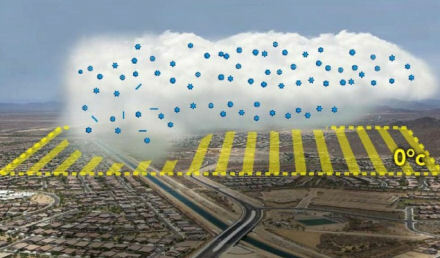 The unmanned aircraft made measurements of the brown clouds from different altitudes, creating a profile of soot concentrations and light absorption that was unprecedented in its level of vertical detail. When the researchers fed both greenhouse gas and brown cloud data into computer climate models, the simulations yielded an estimate that the region’s atmosphere has warmed 0.25 degrees C (0.5 degrees F) per decade since 1950 at altitudes ranging from 2 to 5 kilometers (6,500 to 16,500 feet) above sea level. The analysis revealed that brown clouds were implicated in the temperature changes that have been observed in the region over the last half-century. It also indicated that south Asia’s warming trend is more pronounced at higher altitudes than closer to sea level. Many of the glaciers in the Himalayas are found at those altitudes.